Flora Vaccarino, M.D., is the Harris Professor at the Child Study Center and Professor of Neuroscience at Yale University. 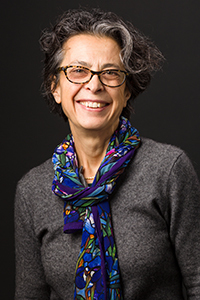 She directs the Developmental Neurobiology Laboratory and the Program in Neurodevelopment and Regeneration at Yale University. Her lab uses animal models and human brain tissue to unravel the pathophysiology of neuropsychiatric disorders. She pioneered a “cortical organoid” model, where human brain organoids derived from induced pluripotent stem cells (iPSCs) grown in a tri-dimensional culture recapitulate the early development of the human telencephalon. Dr. Vaccarino participates in the PsychENCODE consortium (http://psychencode.org/), and her lab is mapping noncoding RNAs and functional DNA elements in human iPSCs, brain organoids and corresponding postmortem fetal human brain specimens. Another major interest is the study of genomic mosaicism in the brain and its emergence during normal human development. She is part of the Brain Somatic Mosaicism Network, a NIMH-sponsored consortium that studies somatic genomic variation in neurodevelopmental disorders (https://www.synapse.org/bsmn). Dr. Vaccarino is a member of the Kavli Institute for Neuroscience at Yale and Fellow of the American Association for the Advancement of Science.